^ "ANC chooses women to be next premiers of Free State, Mpumalanga". News24. Retrieved 22 April 2018. ^ Cana, Frank Richardson (1911). 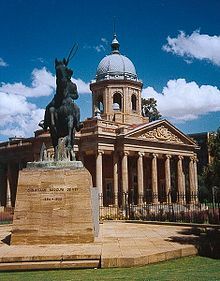 "Orange Free State § Inhabitants" . In Chisholm, Hugh (ed.). Encyclopædia Britannica. 20 (11th ed.). Cambridge University Press. p. 152.